Brad brings more than 25 years of marketing, sales, and management experience to the Straight North team as Director of B2B Marketing. With a lifelong passion for reading and writing, he has been an active and respected blogger since 2005. His firm, Word Sell, Inc. - acquired by Straight North in 2010 - was among the first to bring social media marketing concepts and strategies to the business community. A graduate of Northwestern University, Brad is a skilled SEO copywriter, social media marketer, and content strategist. Follow Brad on Twitter: @bradshorr. Websites play a significant role in building and strengthening brands. Whether you’re re-launching a website or introducing a new one, it’s a powerful opportunity to position your company for success. 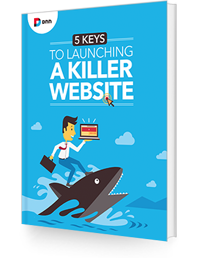 This eBook provides you with 5 Keys to Launching a Killer Website.